Guess what today is? Only the best [unofficial] food holiday: Cookie Dough Lover’s Day. Why is it Cookie Dough Lover’s Day? Because Lindsay’s cookbook, The Cookie Dough Lover’s Cookbook, is available for purchase today. And because any day is a day to celebrate cookie dough. Especially when there are sprinkles involved. You know what I mean? So last Tuesday, several of us so-called cookie dough addicts lovers had a Twitter conversation about said love affair and decided to unofficially declare today a national food holiday because: a) we can and because b) seemingly everyone loves cookie dough! So go ahead, feast your eyes on my egg-free confetti cookie dough creation: confetti cookie dough bites. Not only do I have a thing with cookie dough, I have a thing with sprinkles. And as I mentioned yesterday, I will always choose sprinkles (or Skittles) over chocolate, so my choice for egg-free cookie dough was decidedly a sweet, sugary dough with colorful sprinkles! Egg-free cookie dough bites studded with multi-colored sprinkles. Perfect for smoothies, blondie bars, or afternoon snacking at the pool! Beat the butter and sugars together until fluffy, about 2 minutes. Mix in the vanilla milk or cream. Slowly mix in the flour and salt and mix until fully incorporated. Fold in the sprinkles. Roll into 1-inch bites and place onto a parchment-lined baking sheet. Refrigerate to allow the bites to harden. I can't lie and say that I didn't eat several of these as a snack when I made them. But they have many uses: roll them into smaller balls to add to ice cream; use them in smoothies, or instead of rolling into bites, spread them onto a baked batch of brownies, blondies, or cookie bars and refrigerate until set; add a small amount to the cored center of a cupcake before frosting for a surprise center; add 3-4 more tablespoons of milk or cream and mix thoroughly, then serve with graham crackers, fruit, marshmallows, etc. for a fun dip! Adapted from egg-free cookie dough recipe by Lindsay Landis. These are adorable and so much fun! I love the way you guys are celebrating Lindsay’s book. You guys are just too sweet. And man, these look dangerous! I could imagine just having a stash in front of me and eating it until it’s all gone! These look wonderful, I’m not sure I would do anything other than eat these straight up! Which is exactly how I ate them! Oh yes. I like this. These are so cute and creative! I am totally going to make these with the kids. And I love your other ideas about what to do with the, especially using them in ice cream or brownies! Oh my!!! These are so stinkin’ cute! I need these in my life. stat. What a brillant idea! These are lovely little cookie dough bites! When you stick those gorgeous cookie bites in a dough like that, it gives me free reign to eat them like appetizers. Awesome treat and psyched about Lindsey’s new book! that is exactly how i ate them. every last one! Nothing beats little cookies dough bites especially when they have sprinkles in them! Love these! Oh my. 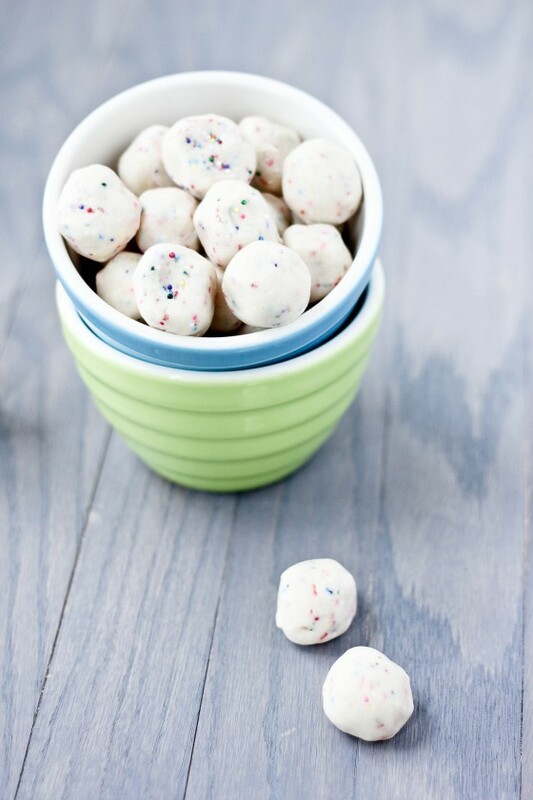 Those are like Funfetti Truffles! My goodness, I think I’d inhale the entire batch! These look awesome. Making these. Sooooooo. Freaking. Making. These. These look fabulous. i am all about sprinkles. Sprinkles make the best celebration foods 🙂 Love this national holiday idea and love these! OMG you definitely took cookie dough to a total different next level!! They look like frozen yogurt bites, but so much better! I bet they would be amazing mixed into yogurt! These treats look so festive and colorful! Totally fun to create. Great for parties and kiddie events. Yes, everyone loves cookie dough – especially eggless versions that are meant to be eaten raw! 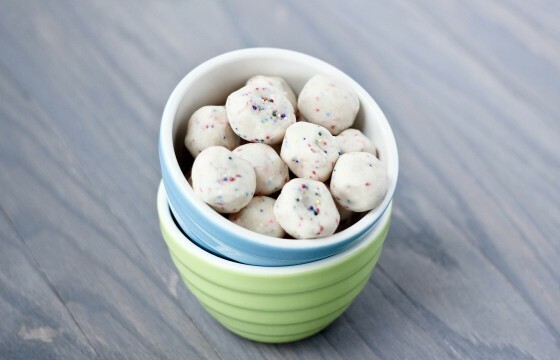 Confetti cookie dough bites are so fun – great recipe! You do realize I would stuff my pie hole with the whole batch right. These are adorable. I love these so much. Man I wish we were neighbours. Those looke like they taste EXACTLY like fun fetti cake dough. Yummy! I will have to make a batch! These look totally addictive, and that cookbook is #1 on my wishlist…every recipe I’ve seen from it so far looks incredible! Beyond precious. There must be something wrong with me – all I can think about is tiny little bits of these in trail mix. Help! Oh goodness, what a great idea! How awesome would it be if we made this an OFFICIAL official holiday and got the day off from work to eat cookie dough?? AMAZE. Oh i love the sound of these. 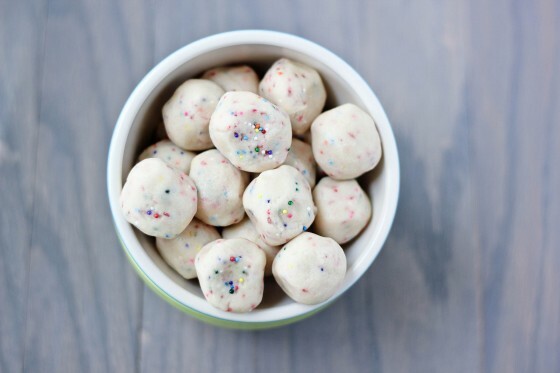 Funfetti is one of my favorite cake flavors but I think I’d love it even more in cookie dough ball form! Amen to that! Sprinkles are always the best! So cute! I love all the ideas you give for the dough! How fun are these!? My girls would LOVE these!! yep… these look like the best eggless cookie dough bites ever! I love sugar cookie dough and can never resist it! I love it! Eating cookie dough has always my favorite part of making cookies and I love all the cookie dough bite variations. Oh my! I would eat all of these! Cookie dough is such a horrible/wonderful weakness! My preordered copy was waiting for me when I got back from Europe this weekend! I am so excited to dig into it. I love these! And the bowls…. I have them too!